The IMF released a few new reports on the global economy today and a raft of new data. There is plenty of interesting stuff in there which we are still pouring over, but a couple of graphs caught our eye straightaway. The chart demonstrates the huge level of capital outflows from Spain and Italy at the start of this year. This is mostly a result of investors and depositors pulling funds out of these countries and moving them into alternative assets, often in northern European countries. The latter fact is confirmed by the ensuing increase in Target 2 imbalances, suggesting this money is moving to elsewhere in the eurozone 'Eurosystem' but has yet to be settled (as is the nature of Target 2). The importance of this movement shouldn't be underestimated. It speaks to the increasing sovereign bank loop as domestic banks step in to cover the outflow of capital, raiseing questions over how long these governments can issue debt if investors are so intent on pulling capital out of the country. 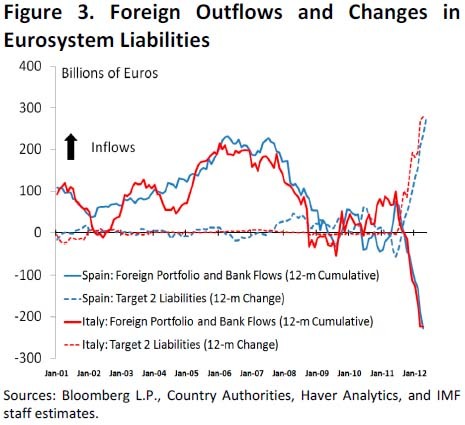 It also makes one wonder over the stability of banks (especially in Spain) if they are facing deposit outflows and lowered demand for their financial instruments from foreign investors. In other words, a worrying graph for these countries. 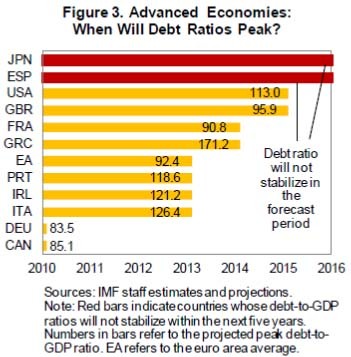 Not much good news for Italy or Spain (alas, as per usual). With the 20 July meeting now looming large some definitive answers are needed, at least in terms of the Spanish bailout. Also the Euro going South is negative for the PIIGS. It basically means shorting a basket Euro stuff (of which a considerable part will be PIIGSish). Fig 3 probably says it all. 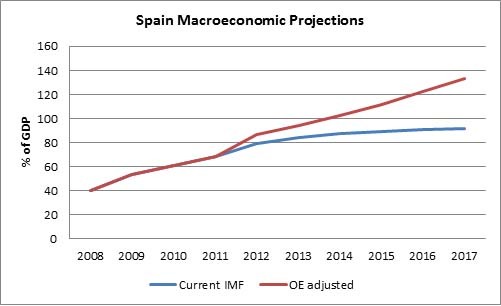 Spain's debt will not peak in a reasonable overseeable timeframe. Interesting stuff in Germany over the Spanish guarantees. Looks the only way they can get it approved in parliament (CSU demands). Schauble likely creating another case for the Constitutional Court. -12 09 Ruling on the emergency case there. Eerily reminiscent of 20 years ago when John Major and others kept insisting that there was no question of leaving the ERM when it was perfectly obvious to the man on the street that we not only should and could but wood. The IMF is an illegal, illagitimate global banking cartel, whise interest is soley in enriching, empowering and aggrandizing the people controling that cartel. So, why on Earth does Open Erope -- and anyone else for that matter -- either believe the information the IMF distributes or even care about that information? Come on EU: you can do better! Grind them into the dirt! Make them suffer year after year! Let them know who is in charge! Humiliate those Latinos! Whatever you do, don't give up your well paid sinecures, your dreams of ruling the world! Take it all down with you when you go!. Is Spain tougher than the UK on EU immigration? Could this 'concerted action' fly? 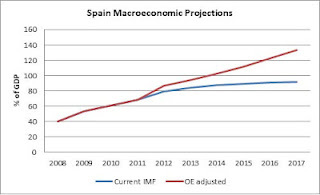 How long can Spain fund itself at these levels? A triumph for European Parliamentary scrutiny? Where does the ESM stand? Is Britain the new model for Europe to follow? A summit plus for Greece?